Sharon Pierre-Louis, Marie France Arcilla and Alexandria Wailes. Photo by Jenny Graham. Our Town is an interesting period piece which shows, albeit indirectly, the humble bedrock for which these United States originate. It is beyond the tenets of the “Protestant Work Ethic”, but further, the moral virtues of the Protestant faith itself on full display. This display, however, is nothing dramatic; nothing more dramatic than an everyday life in a forgettable New England town; what would be quintessential fly-over country at the turn of the 20th century. Yet it insightfully portrays an arduous sustenance of faithfulness in the community that is so idiosyncratic on the world stage, the play helps us comprehend how it was even possible for Western Europe to germinate the seeds of capitalistic endeavors. This presumes, of course, what I have espoused in my essay On The Christian Business Ethic – that capitalism necessarily requires a faithfulness in one’s neighbors in order to blossom into the quasi-oligarchical institutions it is now so vilified for bringing forth as fruit. “It”, meaning “capitalism”, is still fundamentally an associative exchange between individuals who, within a Protestant paradigm, have irreducibly individuated souls, personally owned and therefore personally responsible for its determination of virtue or vice, being able to, as Max Weber refers, transform the soul towards a state of grace. And it is wonderful to see the laudable side of predestination permeate the community; liberated from the Church, individuals change from being lambs to being leaders of their final destination. Intellectually Our Town is quite stimulating in this manner. Dramatically, while effortlessly absorbing the cadences of a town comprised of 85% Protestants, it is at times painfully banal during the three acts. This is no fault of the production, or even the fault of the original playwright Thornton Wilder. American Protestantism has this fundamental element of insipidness: to be extraordinary is to be vainglorious. There is pride in resembling a material meekness whilst acting moralistically Christian, viz. acting with brotherly love, as mentioned, and is the taciturn atomic base of what the world has now become. This epoch of course, of a small town adapted to industrial modernity through being connected with the outside world by rail, has gone by the way side. It seems completely anachronistic for a peace keeping officer to allow the town-drunk to be drunk, just not in front of the eyes of children. What other religious faiths would, without their own moralities, allow an individual to be so freely slovenly? This is such a fascinating examination then in the conjuncture between Protestantism and the sacredness of property rights and it is worthwhile to explore in its own right. Further anachronistic is the upmost elegant manner in which the play demonstrates a high-fidelity society which is practically a spectre now in this century when, in the play, a boy can’t afford to pay a store owner for his sugary beverage immediately, yet the store owner gives him, rhetorically, 10-year credit terms. Only in the tiniest communities now, however speckled they are across the country, can such communal bonds be had. In the major metropolises, it is routine to treat humanity so abundantly, and henceforth not preciously; to frivolously treat other souls as inhuman and as means for selfish ends; even as obstacles to one’s ends. This fedlity suggests Adam Smith’s insights into rational self-interest, but I contend that even more fundamental to the selfish economic instinct within a Protestant community is the selfish cultivation of the soul in presentation toward’s each other. Perhaps, then, there is a tinge of subterranean pride underneath the site of the play, in Grover’s Corners, New Hampshire? Most remarkable with the entire narrative is the modern conception of the afterlife. Gone is the idea of a completely desultory world of bliss and of sublimity. Gone is any radically imagined poeticizing as we find with Dante. The afterlife is permanently emulsified within the world, with whatever magic that exists transcendental to living still bound to the lifeline of the deceased. And not in a pleasant manner. In fact, scornfully the opposite! The deceased of Grover’s Corners are granted a wish to re-live any day of their life, but soon find out that nostalgia is short-sighted, forever tarnishing the best memory they ever had of living. It raises the question of if the best taste of life can be nullified, what is the point of living at all? I won’t investigate this paradox further; it is only amusing to see the extenuation of the Protestant imagination toward neutralizing the proclivity of mankind to enjoy itself, in stereotypical fashion. On technical matters, this play was directed with the characters dually speaking in sign language. Our Town was a wise choice in producing a play where this duality was pulled off commendably. 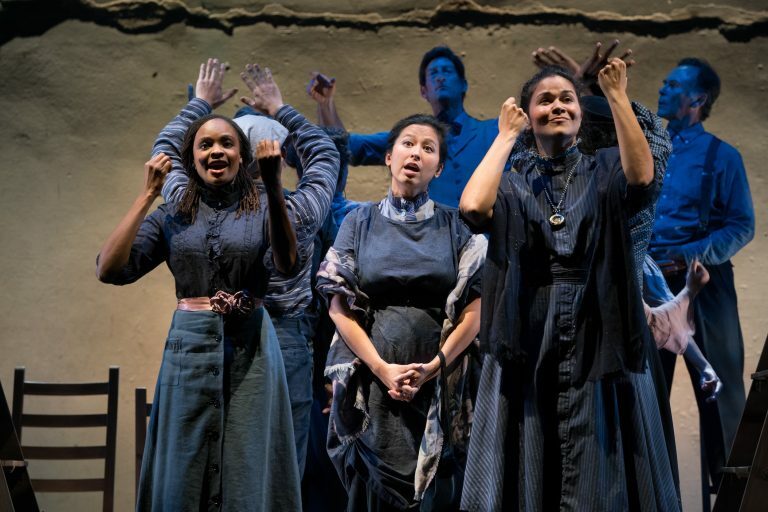 The integration of characters whom speak for the presumed deaf actors into the town itself is a worthy act of creativity. It is a salubrious acculturation of sign language. And it is no easy feat for actors to study a three act play with the addition of acting it in another language. Additionally, the stage lighting was also superb in presenting a real sensation of time-shift during the staged day. Concluding, the play is recommended for those who wish to feel like mediocre New England Protestants.